MR Online | Can someone inform Donald Trump that Muhammad Ali doesn’t need his pardon? Can someone inform Donald Trump that Muhammad Ali doesn’t need his pardon? Posted Jun 11, 2018 by Eds. U.S. president Donald Trump has an uncanny knack for making a fool of himself, bettering his absurdity mark each time. Trump’s latest foot-in-the-mouth moment came on Friday when he said he was considering a pardon for boxing legend Muhammad Ali, clearly, as always, unaware of the fact that the late former world heavyweight champion does not need one. Ali, who was convicted in 1967 for refusing to be drafted into the U.S. army during the Vietnam War, was sentenced to five years in prison and was handed a fine of $10,000. His famous words, “I ain’t got no quarrel with those Vietcong,” while refusing military service, became one of the symbols of the movement against the war. Ali, considered as the greatest professional boxer of all time, was 25 at the time and in his prime. He was banned from boxing for three years. However, Ali appealed against the conviction and the U.S. Supreme Court handed a pardon–that too in an unanimous verdict in his favour–in 1971. Trump, once again, threw facts out of the window while talking to the media ahead of his departure for a Group of Seven (G7) economic summit in Canada. “He was, look, he was not very popular then, certainly his memory is popular now. I’m thinking about that very seriously, and some others,” Trump was quoted as saying by the Chicago Tribune. “The power to pardon is a beautiful thing,” he added. Ali’s lawyer Ron Tweel responded to Trump’s statement, informing the president that Ali didn’t need a pardon. “We appreciate President Trump’s sentiment, but a pardon is unnecessary. 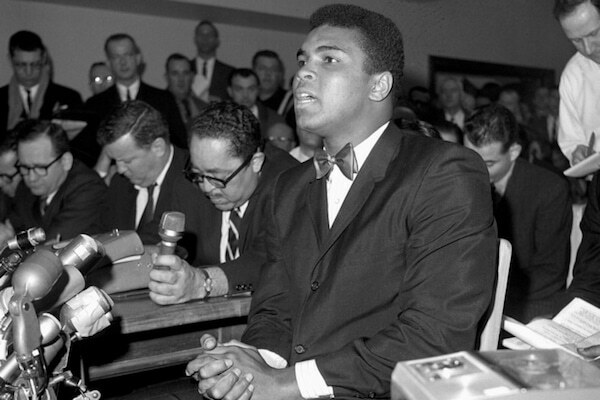 The U.S. Supreme Court overturned the conviction of Muhammad Ali in a unanimous decision in 1971,” he said. There is no conviction from which a pardon is needed. At this point, one can’t help but remember the time when Ali, disturbed by the Islamophobic rants of Trump in 2015, chided the then Republican presidential candidate with a 132-word statement. Ali’s words, which came after Trump announced his plans to ban Muslims from entering the U.S., were a throwback to his boxing days, when he never used to mince words while taking on opponents or socio-political issues. “I am a Muslim and there is nothing Islamic about killing innocent people in Paris, San Bernardino, or anywhere else in the world. True Muslims know that the ruthless violence of so called Islamic jihadists goes against the very tenets of our religion,” said Ali. “We as Muslims have to stand up to those who use Islam to advance their own personal agenda. They have alienated many from learning about Islam. True Muslims know or should know that it goes against our religion to try and force Islam on anybody,” he added. “Speaking as someone who has never been accused of political correctness, I believe that our political leaders should use their position to bring understanding about the religion of Islam and clarify that these misguided murderers have perverted people’s views on what Islam really is,” he concluded.